Perhaps nowhere on earth do the ancient and modern come into such stark juxtaposition as on the narrow streets of a small Tuscan town. 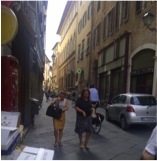 Pedestrians, pets, strollers, bicycles, walkers, wheelchairs, motorcycles, private cars, taxis, trucks, buses, ambulances and horses all share these cobbled laneways, apparently with equal access. 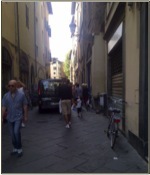 There are no lane dividers (there being only one lane), no bicycle paths, no sidewalks. The only rule, unwritten of course, is that if something larger or faster is approaching, best get out of the way. Adding to the apparent confusion, most people are smoking, texting and talking (actually yelling) on cellphones, some all at the same time. Keep in mind that most of these folks are Italian, a people not known for either patience or stoicism. And yet, it all seems to work. Everybody moves along, no fuss, surprisingly little agitation. To the North American sense of order and compulsion for efficiency, all this seems bewildering. How is this allowed in a presumably civilized country? How do these people tolerate such apparent chaos and, one must ask, why do we in Canada seem to have so much angst about what we perceive as “traffic”, given more space, wider streets, fewer people, and sensible rules that are generally adhered to. How do we account for this? Is there something to learn here? To all this, I offer some theories, developed after making the strategic decision to stop moving and instead spend more time sitting in one of the many sidewalk cafes and watch the flow of humanity over plenty of espresso, dolci and vino rosso. Firstly, there’s a sense of permanence and continuity in such places that provides perspective. When you find yourself casually leaning against a column or archway that dates back two millennia, you gain a sense of yourself in time and history that is rather humbling, promotes acceptance and disavows one of the responsibility to improve upon every imperfection. The urge to “bring order” becomes a decidedly new world notion. There’s also a profound respect for what is established and has withstood the test of time. One would no more paint a traffic line on these ancient streets than one would paint trousers on Michelangelo’s David. There is a certain humanity and humility in the acceptance of chaos in order to preserve the history. And, of course, there’s that famous Italian temperament. Italians, it must be said, have no love of rules and regulations. In fact, they fundamentally reject direction. However, they are an instinctively generous people who will generally do the right thing, as long as it isn’t required of them. Moreover, they seem to almost admire a creative flouting of the rules. Any understanding of how Silvio Berlusconi was able to gain and hold power for so long in the famously fickle Italian political structure must really begin with an acceptance of this quintessentially Italian characteristic. Finally, perhaps the best lesson of all, I found I learned much more when I stopped trying to dodge collisions and instead found a comfortable vantage point to observe and ponder. Surely, a lesson to take home and apply to the steady stream of challenges and unexpected obstacles that continually come our way. And the vino rosso certainly didn’t hurt. Have you ever used brainstorming in your teaching? If you want groups of students to come up with a variety of ideas quickly, brainstorming is one tried-and-true way to get creative juices flowing. Since the concept was introduced in Alex Osborn’s 1953 Applied Imagination, brainstorming has caught on in business, education, volunteer organizations and elsewhere to generate ideas and solve problems. Last week I saw a post on Twitter that suggested “brainwriting” rather than brainstorming. I was intrigued and clicked-through, only to find a new name for a familiar best practice: brainstorming works best when it’s planned, not haphazard, and it starts with the individual, not the group. As described by Patrick Allan (citing work of Leigh Thompson and Loran Nordgren) brainwriting avoids the brainstorming pitfall of anchoring: where an early idea streams all other suggestions in a particular direction. “Brainwriting” gives individual team members time to write down their own ideas free of others’ influences. Osborn himself advocated this (although he didn’t use the term brainwriting), asserting that the best ideas come from a blend of individual and group work. Classroom brainstorming shouldn’t be unplanned: students should have prep and thinking time. 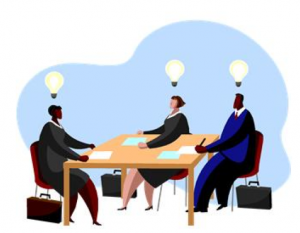 Assign roles within the brainstorming group. Groups need a moderator (to guide discussion, keep the group on topic, and encourage wide participation), a scribe (or two) to capture the ideas (using either flip charts, Post-It notes, computers or consider audio recording), and members (to contribute and build ideas). Remember, the students who are the moderators and scribes aren’t actively brainstorming while they’re attending to their key roles. Encourage teams to share these tasks throughout a term, so it’s not always the same couple of people who end up taking notes rather than contributing their ideas. And, what to do with all those ideas the groups generate? Sutton points out that brainstorming should “combine and extend ideas, not just harvest them,” so have a plan for what you want students to do next. Prioritize the A’s in terms of their importance, urgency, or applicability to the problem at hand. The Education Team can help you with incorporating brainstorming and other techniques in your teaching. Contact us to arrange for one-on-one coaching or to facilitate a workshop for your team. 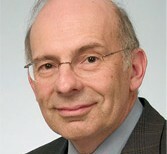 Davis, B. G. (2009). 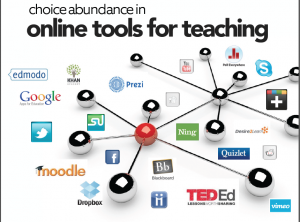 Tools for teaching (2. ed.). San Francisco, Calif.: Jossey-Bass. Harris, T. E., & Sherblom, J. (2011). Small group and team communication (5th ed.). Boston: Pearson/Allyn and Bacon. Johnson, D. W., & Johnson, F. P. (2009). Joining together: group theory and group skills (10th ed.). Upper Saddle River, N.J.: Pearson/Merril. Should Medical Schools be looking for it? Should Medical Schools be teaching it? What do professional sports teams, executive search firms and medical school admissions committees have in common? (This is not a trick question). Answer: they are searching for young people with the quality of resilience. Resilience, quite simply, is essential if the talented are to achieve success. Resilience is what has allowed communities and even peoples to survive and rebuild despite incredible suffering and losses. Resilience is what got the British through the bombardments of the Second World War. Resilience is what motivated so many of our ancestors to seek greater opportunities in this country. Resilience is what our patients demonstrate as they endure their illnesses. Resilience is what allows physicians to deal with stress, long hours, inability to “cure” every patient, and to function in a world that often fails to recognize or even acknowledge their efforts. The lack of resilience has been cited as a major cause of “burn out” in students, residents and qualified physicians. So how can we characterize resilience in learners and practitioners of Medicine? In a 2013 article, Zwack and Schweitzer (Academic Medicine 2013; 88:382) pose the intriguing question “If Every Fifth Physician is Affected by Burnout, What About the Other Four?” They conducted 200 interviews with physicians of various ages, disciplines and level of training who, upon assessment, were found to exhibit high levels of personal accomplishment and low levels of characteristics associated with “burnout” (emotional exhaustion, depersonalization). The analysis identified a number of factors these high functioning physicians shared, including gratification from the doctor-patient relationship and satisfaction from medical successes. These also exhibited what the authors called “resilience practices”, including leisure time activities intended to reduce stress, cultivation of contact with colleagues, good relations with family and friends, proactive engagement with the limits of skills and treatment errors, personal reflection, spiritual practices, and ritualized “time-out” periods in their schedules. They also identified a number of “useful attitudes”, including acceptance and realism, self-awareness and reflexivity, active engagement with limitations, recognizing when change is necessary, and appreciation of positive experiences. Sarles and colleagues surveyed 141 general surgery residents and found that measures of “grit” were predictive of later psychological well-being (Am J Surgery 2014; 207(2): 251). In their editorial to the Zwack paper, Epstein and Krasner (Academic Medicine 2013; 88: 301) point out that physicians are at particularly high risk, and therefore even more vulnerable. “All too often, busy clinicians ignore the early warning signs of stress – fatigue, irritability, and feeling outside their comfort zone – in the hope that the situation will self-correct or that their baseline adaptive skills will carry them forward”. All well and good, but can anything be done for the resilience-deficient? One might imagine that resilience is an inherent quality determined by one’s genetic makeup and therefore beyond learning or development. Apparently not. Sood and colleagues tested the utility of a resiliency training intervention consisting of single 90 minute one-on-one interactions among their colleagues in the Department of Medicine at the Mayo Clinic (J Gen Intern Med 2011; 26: 858) and found significant improvements in a number of measured wellness parameters, including resiliency, perceived stress, anxiety and overall quality of life. 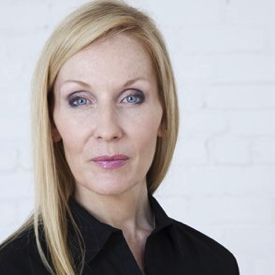 Gail Wagnild is both a Registered Nurse and PhD psychologist who has been promoting the concept that although we can’t avoid adversity in our lives, we can choose how to respond to such events in a way that promotes personal resilience. In “Discovering Your Resilience Core”, she describes five essential characteristics of resilience (purpose, perseverance, self-reliance, equanimity, and existential aloneness) and how each can be identified and strengthened. So it appears the answer to the two questions I posed are “yes”, and that resilience is not only something that can be recognized, but also developed. Given its importance to career success, it would seem advisable for medical schools to both recognize it as an attractive (maybe essential) applicant quality that should be actively searched out, and also promote it’s further development in our students. Admissions committees will have long debates about which personal qualities are the most relevant to career success. I vote for resilience. Prior to a new or amended policy or regulation being submitted for MD PEC approval, it must be published for review and comment by faculty and/or students within the School of Medicine. Feedback received will be directed to the Policy Sponsor. In the event that major changes are made based on this feedback, a new draft will be posted for additional comments. If you wish to comment on any of these items, please either use the link provided under each or email saunderj@queensu.ca. Comments will be forwarded to the policy sponsor prior to the policies submission to MD PEC for approval. Incorporating technology into teaching should focus on providing high-quality learning experiences for students, not just adding the latest tech fad to your teaching toolbox. Matrix, a Queen’s National Scholar and Associate Professor with the Department of Film and Media, Faculty of Arts and Science, addressed the topic of High-Engagement and High-Tech Teaching and Learning Experiences, by Design. Although most of today’s students have grown up with technology, they’re not all the tech experts some may expect. 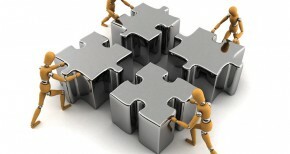 They have surface knowledge of technology they use, but not necessarily a broad range of skills. And while students may not have deep digital competencies, they expect faculty to have them, Matrix said. The first step to enhancing teaching with technology is addressing the faculty tech-skills gap through faculty professional development, Matrix suggested. This, she acknowledged, may be easier said than done: the biggest barrier to tech adoption by both students and faculty is time. So, why bother with educational technologies? The payoff in student learning has been studied: teaching with edtech and social media improves student outcomes by 10 percent. And what about the distraction factor? Another study Matrix cited revealed students with smartphones study 40 extra minutes per week versus those without them. Matrix advised faculty interested in incorporating more technology in their teaching to seek out innovators within their own departments and schools: approach these people to find out what’s worked for them and what hasn’t. She said blended learning teams should include ITS consultants, instructional designers and faculty peer mentors. Key messages: don’t go it alone and don’t think you have to reinvent the wheel. And, she emphasized, focusing on students’ learning experiences—not the technology—is the key to success. Like all good teaching, teaching with technology should focus on excellence and engagement, not just adding in a tech tool or two – or 20. 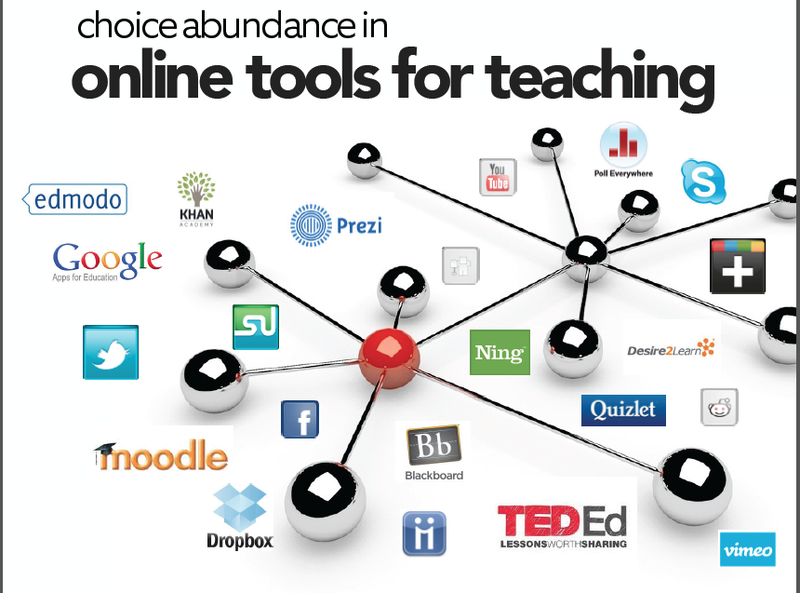 While there’s “choice abundance” in online tools for teaching—Matrix pointed out there are over 2000, producing “choice fatigue”—too much technology can turn a good course into a “Frankencourse”, producing frustration for all concerned and lower student learning outcomes. 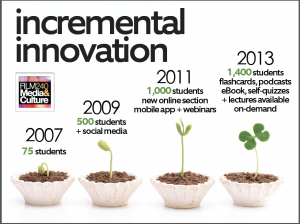 Matrix also advocates incremental innovation, pointing to her own Film240 Media and Culture course: its first iteration in 2007 had 75 students; by 2009 it had 500 students and a social media component. 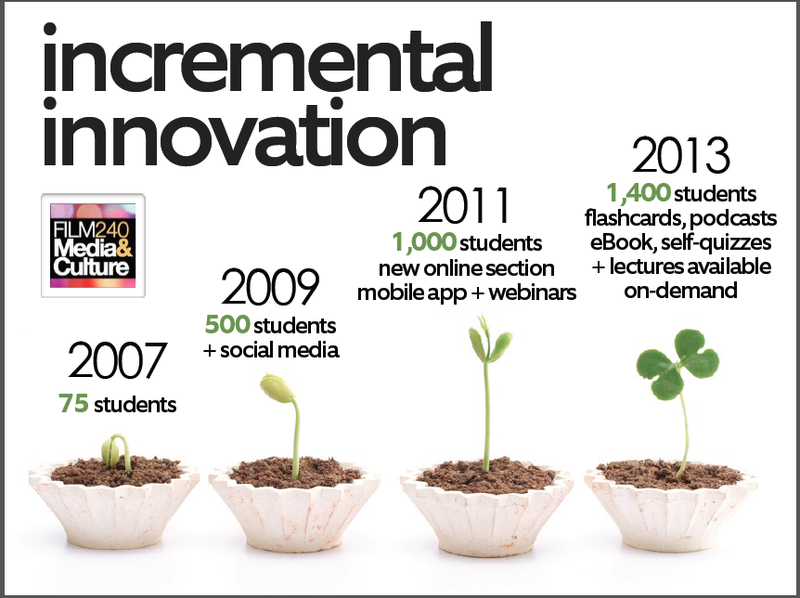 In 2011 she added a new online section, mobile app and webinars and boosted enrolment to 1000. The 2013 class had 1400 students, e-flashcards, podcasts, eBook, self-quizzes and lectures available on demand. Her point: she didn’t do it all in one term, or even one year. One technology-assisted assignment Matrix showcased in her presentation was infographic digital posters, used as an alternative to a research essay assignment. These are shared via the course Learning Management System (LMS) for peer-to-peer inspiration and feedback. Students can use Piktochart to create their assignment. These aren’t just pretty posters, but well-researched assignments presented in a visually-appealing, accessible way. “It’s visual storytelling with research narratives,” she said. What’s your favourite tech teaching tool? Let us know what it is and why it works for you by sharing in the comments. If you’re interested in tech teaching training, let us know what topics are of interest to you. We’ll incorporate these requests in our future UGME faculty development planning. Find the full slidedeck from Dr. Matrix’s presentation here. You can find more on trends in digital culture, communication and commerce, with emphasis on social, mobile, and educational technology at her Cyberpop! blog.